James Zuccollo, from the Education Policy Institute, said there was evidence that “targeted pay increases” could greatly reduce the looming crisis. “Recent research suggests a 5% pay supplement for early-career science and maths teachers could have avoided the increased shortages since 2010, for instance,” he said. Hinds has announced that English schools will no longer be punished for failing to meet government standard on tests, in an attempt to release teachers from the stress of results and stop schools with challenging pupils from being punished. He also wants to cut down on marking, data collection and lesson planning. Labour is pledging to end the public sector pay cap with additional, ring-fenced funding. 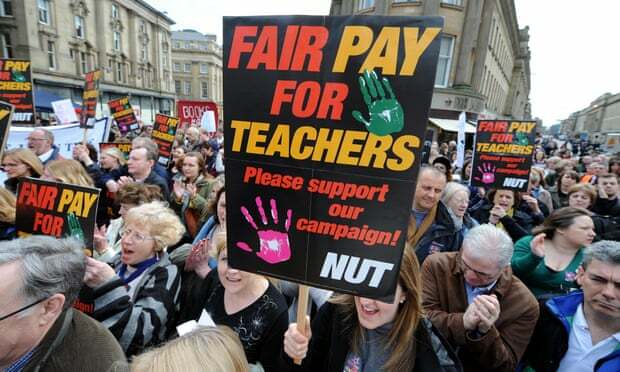 A Department for Education spokesperson said: “Last summer saw the biggest teacher pay rise in almost 10 years, worth between £800 and £1,366 for classroom teachers and supported by a £508m government grant. In addition to an annual pay award, many teachers also receive increases from promotions and responsibility allowances.